This will probably have to be a short description of the day’s ride as I am back in a wigwam, and this wigwam is far more authentic than the ones in Rialto/San Bernardino. No wireless (working or otherwise), no Ethernet, no phone, and no grounded outlets. One difference between this MacBook Pro and our old PowerBook is that the AC adapter requires a three-pronged, grounded outlet. I admit that I was a bit anxious to get on the road and start in on our 88 miles before the wind kicked up, as all the forecasts said it would. We rolled out of the motel parking lot at a bit past 7:30 and started out of Flagstaff, which was fairly pleasant as it was Sunday morning (or so I’m told), and we were already pretty much on the east side of town. It was chilly, but the skies were cloudless and the wind was actually helping us as we began gradually descending. I quickly lost sight of Anurang but decided to just keep on going as there were lots of other riders around. Almost as soon as you leave Flagstaff and get on I-40 to head east, the trees disappear and you are back in a more prairie/desert environment. I noticed a couple of semis parked by the on-ramp as we got on the interstate; in one of them I could see the driver sleeping with his head on the steering wheel. This first interstate section went pretty quickly and I passed a few riders who had left ahead of me. Eventually, I saw another rider in my rear-view mirror and guessed correctly that it was Leon. 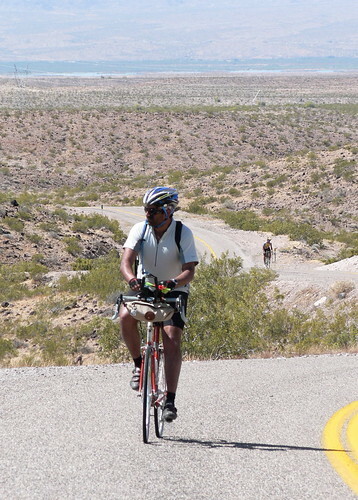 He pulled up alongside me and we rode together past the Twin Arrows trading post (now deserted and apparently slated for a housing development) and the Diablo Canyon. Oh, and I forgot: Winona, although I don’t recall actually seeing anything there. We stopped once to take pictures of the view back up the highway with the snow capped peak above Flagstaff visible. After 35 miles, we reached the first rest stop, which was located just past a closed interstate rest stop. I remembered having a rest stop at this same spot five years ago, and it was a good deal more windy then. That’s not to say that we didn’t have wind, but I think that it was coming more from the southwest than directly from the south, so it wasn’t nearly as bad as it might have been. 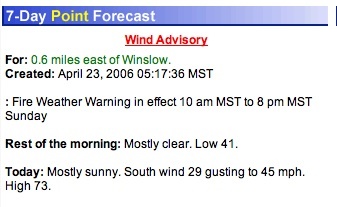 By this time, I was feeling somewhat sanguine about getting to Winslow on the early side for lunch. Pulling out of the rest stop, we agreed that we would skip the first gravel option near Meteor City and concentrate on getting to Winslow by around 11:00 by sticking to I-40. The wind started to pick up, though, and depending on the terrain and our heading our speed varied wildly between 17 and 7 miles per hour. Most of the time, though, we made good progress. 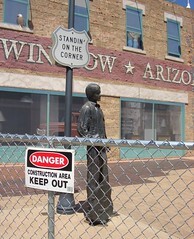 In fact, we got to Winslow just a few minutes after 11, passing “the corner” with its statue of the guy and his guitar. The building that the accompanying mural is painted on burned down a few years ago, leaving only the exterior walls, so the park has been fenced off while they try to find money to repair it. Our lunch was to be at La Posada, a restored Harvey House railroad hotel that truly is a marvel. This lunch was probably ten times nicer than any other we’ll have on this trip, and it was included in the tour (thanks Lon!). The hotel itself is a masterpiece of Spanish hacienda architecture, and I’d love to stay there sometime. It probably even has wireless. According to the brochure I grabbed, the restaurant’s menu features “Fred Harvey specialties and Native American inspired nouvelle cuisine.” I had duck confit. It had lots of beans and corn and other Native American inspired stuff with it. The lemonade was good, too. Leon had never had American-style lemonade before. In South Africa, lemonade is like Sprite (as it is in Britain). Anurang showed up about half hour after us and also had the duck. Leon and I finally left La Posada together while Anurang was tucking into a brownie dessert. The wind was still quite strong, but I felt good enough about our progress that I suggested we take the next optional detour. This was a lovely ten-mile section of old road that got us completely off the interstate. There was still a fair amount of pavement but also a lot of sand. Leon is a good mountain biker, so I tried to follow his lead. It was just enough sand to help build my confidence so that I don’t tense up every time the bike starts to do that sand shimmy thing. We saw no one else on the road at all, unless you count a trio of steers who jumped up and ran away at the sight of us. Back onto the interstate and it was just a few miles to the Jack Rabbit Trading Post. I was going to say that this is a great place to buy a rubber tomahawk but, come to think of it, I didn’t see any rubber tomahawks. I’m pretty sure they had them five years ago, though. Regardless, they were nice folks. It’s clearly a family business. While we were there, Anurang showed up, so the three of us left together and began the final trip to Holbrook, which started with some nice frontage road and eventually landed us back on … the interstate. Before we got on, though, we made a pit stop at a truck stop, which necessitated a) weaving through a dozen semis waiting to buy gas and b) riding directly into the late-afternoon wind as we crossed back over the freeway. As I stood on my pedals, it occurred to me that it might have been the first time I’d ever had to do that while riding downhill. Well, this was a tough day. We had climbing, a stiff south wind, and our first serious off-road riding all conspiring to make this the longest day of the trip thus far. Add to that a few flat tires (two of them mine), and Anurang and I didn’t roll into the ironically named Luxury Inn until something like 5:30. But to begin at the beginning – we had a great breakfast across the street at Lilo’s Café, before rolling out of Seligman on Rt 66 heading east. Most of the day, we were going some variation on east – I guess because Chicago is more or less east of Santa Monica. The wind was already strong when we started on this day, so we didn’t get any easy miles at all. Just a series of long gradual climbs with too much wind. After about 11 miles, we reached the summit of the first ridge that we were climbing. Looking to the southeast, I could see two mountains; one fairly near and one pretty far with snow on it. The nearer one was near Williams, and the farther one was near Flagstaff. It looked a long ways away. After 19 miles, we got on our first section of really old road that was closed to cars. This was kind of exciting, especially since the road itself was relatively ridable. I took lots of photos on this section, though I’m not sure they came out that well. A rest stop waited for us at the end of this road, after which we rode through the town of Ashfork, which is where all the flagstone in America apparently comes from. We then hopped back onto I-40 for a few miles before getting off to ride one of the old alignments. Don’t forget that we’re climbing all this time! This particular section starts out pretty easy (in terms of gravel) and gets progressively trickier. Eventually, it peters out and literally disappears under I-40. At that point, we squeezed through a barbed wire fence, very carefully crossed the freeway, and continued on I-40 East. Getting off a few miles later at Devil Dog Road, we took a somewhat circuitous route to reach yet another section of very old alignment that has now become a gravel road. This was probably the toughest riding of the whole day. It climbed on loose gravel and took a lot of energy. Again, we dead ended at I-40, but this time we didn’t have to cross the freeway to continue east. From here, fortunately, it was mostly downhill to Williams, where we had lunch at the excellent Twister’s Café. Great milkshakes. By now it was clear that things were running a bit behind schedule, and I think it’s fair to say that the culprit was the wind. In general, I think I had a false impression of how easy this trip would be – based on the conditions that we had five years ago. This time around, the wind and the heat are much worse. I, of course, am convinced this is all because of global warming. But still, it’s kind of a drag to take two hours longer to do the same ride and to be as tired as if you were actually on a “real” Pac Tour. Oh well, if I get really trashed, I suppose I can take a rest day somewhere. After lunch, I hung back a bit with Anurang as we… climbed some more. And we weren’t done with either the dirt or the interstate, either. The next section of old road was partially paved and partially sand/gravel. It’s also where I had to fix my two flat tires. I should have found the thorn the first time. Oh well, lesson learned, I hope. Eventually, we got back on I-40 for a long (I’ve been using that word a lot, haven’t I?) trip up to the Arizona divide. That’s when things finally started to get a bit easier as we descended to Flagstaff and then rode through town with a detour though Northern Arizona University to miss the worst traffic. Chinese food for dinner, and now I must stop typing and try to get some sleep. Tomorrow offers a lot less climbing (and a lot more descending), but I hear that the wind may actually be worse. On John Muir’s birthday, we departed Kingman at a bit past 8:00 after scarfing down a complimentary breakfast buffet at the Quality Inn. Few natural forces in the universe are capable of wreaking havoc on a buffet like a bunch of Pac Tour riders almost one week into their trip. Fortunately, this is a smallish group for Pac Tour, so there were a few donuts and toaster waffles left over for the truckers. After the heat of yesterday afternoon, everyone seemed relieved that skies were cloudier and temperatures were cooler on this morning. Anurang and I were just about the last to leave, and we set off with Lon and Jim Meyers (who is also doing some blogging). It didn’t take us long to catch up to some of the other riders, though, as we wound our way through some major road work in Kingman. We were stopped at a traffic light when the window rolled down on a pickup truck to my left and the passenger asked me a question I didn’t quite catch. It sounded to me like the guy had an accent, too. “Excuse me?” I said. “Do you have any grey poupon?” he asked again. “Oh no,” I said. “We’re taking the old road.” And then the light changed. Well, in fact, the old road wasn’t that old today. We could occasionally see it off to one side of the highway we were on, but it was on what is now private property, and it didn’t look particularly ridable at that. This road was a real highway – not an interstate, though – with a reasonably good if somewhat gravelly shoulder and variable traffic that included a fair number of trucks. If a truck passed us while someone else was approaching in the opposite lane, though, our shoulder started to feel a little less roomy. Looking at my route card now, I see that there is not a single turn on it for the 88 miles from Kingman to Seligman. In fact, the road builders did their best to make sure that there were as few curves as possible. This road sometimes ran for more than ten miles straight as telephone line, and it occasionally became frustrating as we pedaled and pedaled and could scarcely tell whether we were making any progress or not. The high-desert scenery, although not quite as bleak as, say, West Texas, didn’t offer a whole lot to look at after you admired the mesas and hills at the far end of the road. At least there were some interesting stops to break up the monotony. 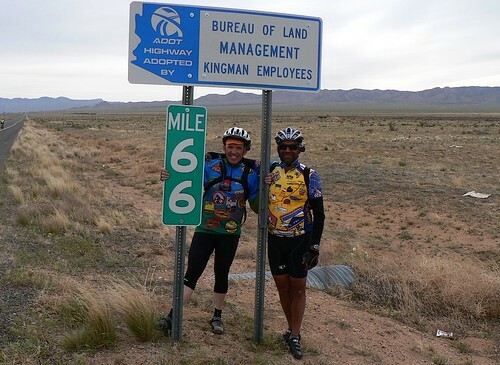 After a pretty fast 12 tailwind-powered miles, we took a photo at mile marker 66, which we had also done five years ago. A further 14 miles up the road was a nice souvenir shop in Hackberry, were I picked up an aloha (Hawaiian) shirt with a Route 66 theme that I can wear to my ukulele group. Somewhere between Hackberry and a SAG stop at Peach Springs, another rider apparently accidentally brushed wheels with Leon and, as he fell down, something on his bike ripped into the Leon’s rear wheel and took out four spokes, as well as disabling the freewheel. They waited 15 minutes before a group of riders that included Lon came along, and Lon swapped rear wheels with Leon. Of course since Lon rides a single-speed bike, that meant that Leon had only three gears (I’m assuming he could still use his front derailleur) to ride the four or five miles to the rest stop (not a problem for Leon, I suspect, as he seems to be a very strong rider). Lon then rode that section on Leon’s rear wheel (after truing it as best as possible with several spokes missing from the same section). Lon was lucky and the wheel didn’t disintegrate. I should have taken a picture of it, as we were at the rest stop when he arrived. By now the wind was becoming stronger but not necessarily favorable. When the wind’s that strong, it has to be right at your back, or it just slows you down. We also had a fair amount of climbing to do at this point; our lunch stop at Grand Canyon Caverns was at 5,450 feet – more than 2,000 feet higher than Hackberry. I had forgotten that Grand Canyon Caverns, and the restaurant adjoining, are at least a mile (up and into the wind) off the highway. By the time we go there, I was ready for something to eat, having only had a banana, a coke, an ice cream bar, beef jerky, a package of cookies and, uh, probably some other stuff, to sustain me since breakfast. The interior of the place always reminds me of the National Park Service’s cafeteria in North by Northwest. I think we slightly overwhelmed them, but eventually I was able to get a grilled chicken sandwich. 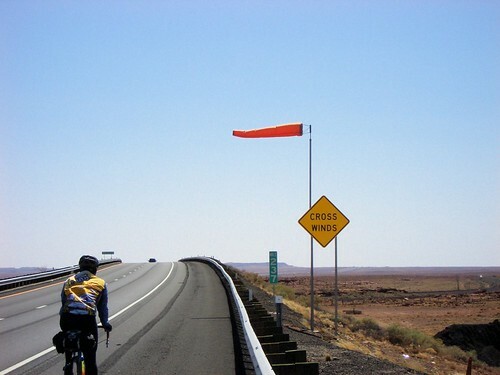 From the Caverns, it was only 27 miles to Seligman, but the wind was pretty bad, and at least 12 of these miles were across one of those giant valleys where the road starts to feel like a treadmill as the mountain never gets any closer. Except that it did eventually get close enough that we had to turn to get around it, which meant heading straight into the wind for the first time all day. This was a good time to be riding behind Lon. However, the ride ended with a four-mile downhill into town, which is always welcome, even when the wind keeps you from doing it at 30 miles an hour. As soon as we’d stashed our gear bags in our rooms, Anurang and I headed over to the Snow Cap to have an ice cream cone and marvel at the schtick they’re famous for. (Ask for a shake, and he’ll offer you his hand; ask for a cone, and you’ll get a traffic cone, etc). How they keep from getting jaded, I don’t know. Must be something to do with living in a small town that’s 80 miles from anywhere and a mile and a half from the interstate. 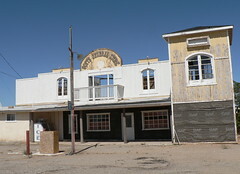 Seligman could have become a ghost town just like so many of the others we’ve seen on this trip, but Angel Delgadillo (a barber) and his late brother Juan (owner and builder of the Snow Cap) made sure that it didn’t. Anurang went over to Angel’s barbershop to see if he could get a shave (well, it’s really 80% souvenir shop at this point), but the barber had left for the day – he’s semi-retired, after all. Dinner tonight was at “The Road Kill” diner – their motto: “You kill it; we grill it.” Since I haven’t killed anything lately, I had a Philly cheese steak sandwich. Don’t know whether I’ll be able to get on-line and post this tonight; the phones are a bit funky at this authentic, historic Route 66 motel, which, as near as I can tell is named “Historic Route 66 Motel.” They have plaques on most of the doors denoting a famous person who has slept there. I was thrilled five years ago to have the room that Will Rogers, Jr. once slept in. (I actually met the man once; his father is a hero of mine.) This time I got the second-coolest (in my opinion) room: Bobby Troup’s. Today we finally left California, which is always a landmark event. Needles, for those of you who’ve never been there, is right on the Colorado River. 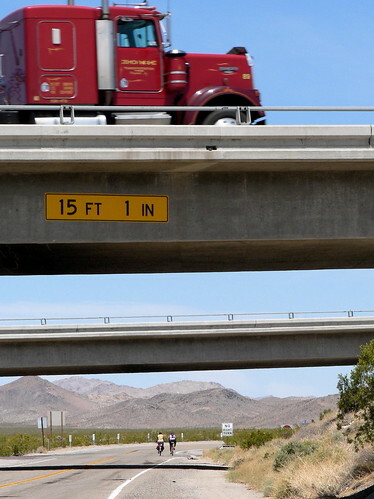 To get on the road to Oatman, we could have just crossed the river on a bridge right there in town, but that wouldn’t have been following Old 66. You see, before the construction of Hoover Dam, it was impossible to build a bridge or ferry landing at Needles because the river would flood. So the bridge that the Joad family from The Grapes of Wrath and other early Route 66 travelers crossed on was located about 14 miles south of Needles, where the river passed through a canyon narrow enough that it could be bridged. So, off we headed south on the National Trails Highway and Route 95. After a little more than six miles, we came to a spot where the old road was still accessible, although it was too sandy for us to actually ride on it. We did stop and go a short distance, though, to where we could see some original asphalt and the curved concrete berms that are a sure sign of genuine archaic road construction. We also looked at a big washout that exposed the entire construction of the road like a sliced layer cake – you could clearly see the macadam and the asphalt layers. Then it was onto I-40 to ride past the old arched white bridge that used to take Route 66 across the Colorado but which now supports only a gas pipeline. 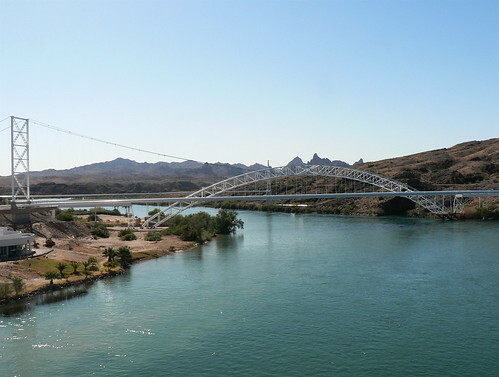 After passing that, we exited the Interstate and started a long, gradual climb on the east side of the Colorado River toward the town of Oatman. 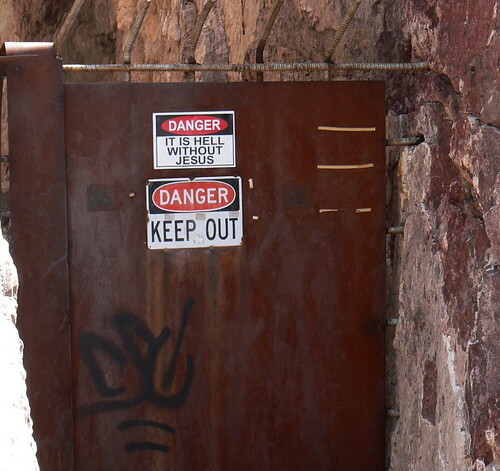 To get to Oatman, we had to climb from about 600 feet to over 2,700 feet. The scenery was different than what I remember from five years ago. The roadrunner-and-Wile E. Coyote mesas and cacti were still plentiful, but I guess that the drought that hit Arizona means that there are fewer wildflowers. We also didn’t see thousands of butterflies, as we did five years ago. 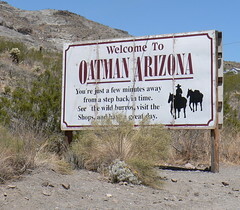 We finally reached Oatman in time for lunch, where I had a great buffalo burger. Anurang bought me lunch to make up for putting a heavy rock in my rear saddlebag when we stopped to look at the old road and then letting me haul it uphill for more than 10 miles. He also made me promise not to write about it. So you didn’t just read this. As for Anurang, he was plagued with “hotfoot” all day, which is a cycling condition that comes from shoes that are too tight and pedals that press against your foot in the wrong spot. He asked Lon for advice and the first thing that Lon suggested was that he move his cleats back as far as possible from the ball of his foot. When we looked at his shoes in Oatman, we discovered that he had a second set of holes where he could screw the cleats in, but we couldn’t get one of the bolts out of his shoe because it was so worn that it wouldn’t work with an allen wrench. Lon said he could fix it when we got to Kingman, so Anurang simply had to grin and bear it. 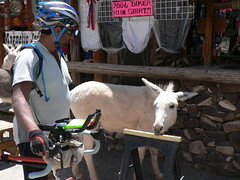 Oatman, by the way, is a former ghost town that has been re-born as a tourist trap. 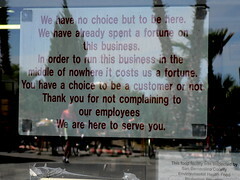 I wasn’t impressed with the place five years ago, and it hasn’t improved since then, although there’s more RV parking. So, right after eating lunch, we started climbing again toward Sitgreaves Pass, which is at 3,500 feet. This climb gets pretty steep in places, but it’s both beautiful and interesting as you pass abandoned mines and cool rock formations. I think that the day was quite a bit warmer than five years ago, and a fairly steady tailwind made it feel even warmer on the climb. The descent from Sitgreaves starts out conventionally, with lots of curves and switchbacks, but eventually it straightens out and you just roll like a ball bearing straight down to the valley floor. This takes a long time, and Anurang got a bit ahead of me, as he is a superb descender. 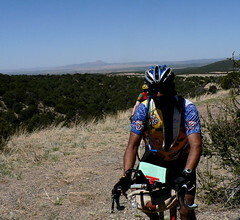 From there, it was a long, straight ride across the valley floor (sorry, I have no idea what valley floor) to the other side, where we started climbing up a canyon toward Kingman and reconnected with I-40, although we didn’t have to get on it this time. A few miles before town, we got to take a “bike-hike” option that involved crossing some rail tracks on foot so that we could ride on a traffic-less old alignment. I remembered this as being really special five years ago, and it was nice this time, but not as pretty as I remembered. 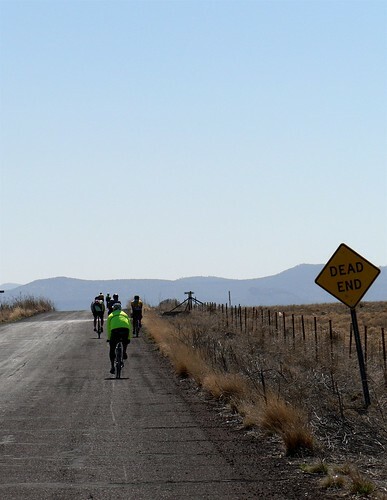 Tomorrow promises to be an interesting day as we ride to Seligman, which is the town where Arizona’s Route 66 revival got its start. 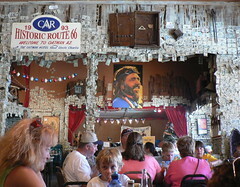 At dinner tonight, Sandi Taylor from Route 66 magazine said that I looked wiped, and I’m sure I did. My eyes feel like I’ve been wearing contact lenses made of sandpaper. It was another day of “abundant sunshine” in the desert, although it was the wind that actually demanded our attention. Like the proverbial “close talker,” it had a way of getting in your face. But, the day started well enough. Anurang and I had time the night before to go for a short walk to some of the ruined buildings of Ludlow and still get to bed early, so we had a good night’s sleep. Last night was our only night of rooming together on this trip – a result of there being a limited number of motel rooms in Ludlow. Honestly, I don’t know how those of these towns that do survive manage to do so. Ludlow, I guess, is still on the interstate, and it seems to attract a lot of truckers. Close to a dozen of them were lined up across the street when we started this morning. So many of the other towns that used to flourish on this route, though, have withered away bit by bit – losing a school, a church, gas stations, motels, cafes. Because this is a desert, you can see the remains long after the people and the business have vanished. One (former) town that we passed by today, Goffs, used to have a thriving store and café; we ate there five years ago. The owner simply vanished one day about four years ago without telling anyone where he was going. We had a rest stop in the parking lot, and I looked through the window – there were still packages of food on the shelves. Another iconic Route 66 spot on today’s ride, Roy’s Café, in the town of Amboy, is completely shut up, as are the motel and school. Anurang was able to buy more stamps at the post office, though. Although it was cold when we went to breakfast in the morning, it had already warmed up a bit by our seven-ish start time (we had to fix a flat rear tire on my bike that Anurang noticed before we went to breakfast) I didn’t bring a jacket – just arm warmers, knee warmers, and a thin wool layer under my PBP jersey (we both wore those today). Within an hour, the arm and knee warmers went in the handlebar bag. Overall, though, the temps stayed fairly moderate until the afternoon. Anyway, we started out with a short, easy climb and not much wind. The first 20 miles were both easy on the legs and extremely scenic. You can see a long way in the desert, and there are always interesting mountains and volcanos on the horizon. The trains – I heard today that something like 250 of them pass through here each day – are a constant presence. Sometimes they’re close by and sometimes they’re so far in the distance that you can see a mile-long train all at once. At one point in the afternoon, we watched as two trains 10 miles away looked like they were on a collision course; even though you knew they weren’t going to hit each other, you couldn’t take your eyes away as they seemed to rush right at one another. After we passed the Amboy crater (last erupted in 1945, it says on our route card; maybe better pedal a little faster) and Roy’s, a van pulled up in front of us and started filming and interviewing Lon. Anurang was a bit behind us at this point. After the van finally pulled ahead, we ran into Bob Moore and Sandi Taylor from Route 66 magazine waiting by the side of the road. Bob was also the ace support crewmember on our tour five years ago. We chatted with them for a few minutes and then continued on to the next rest stop, which was at the top of a hill. Now the wind was starting to get serious, and our average speeds dropped accordingly. It was also considerably warmer; I really felt like I was riding in the desert now. It seemed to take a long time to get to the lunch stop, too. “This should be a milkshake stop,” I announced to Anurang. Alas, it was not to be. The truck stop/café in Essex was a really nothing more than a large convenience store. I was hungry enough that it didn’t really matter that much however. We’d already noticed that my tire looked like it had lost some more air while we were getting to lunch, so we’d stopped to pump it up a bit. I pumped it up even more at lunch in the hope that it was a really slow leak. After a few miles, though, it was clear that I needed to change the tube again. This time we went over the tire minutely to try to determine if there was something stuck to the inside that caused both flats. Couldn’t find anything, though. I can see my bike from where I’m typing this now, in fact, but I’m too tired to get up and see if it still has air in it. I guess I’ll know whether we’ve fixed it by tomorrow. We finally made it to Goffs (the town that formerly had a store), and things got decidedly easier after that. Almost all of our climbing was behind us, for one thing – Needles is at least 1,000 feet lower (on the Colorado River) than Goffs. Also, the wind would be slightly less onerous as we curved around to the south. The pavement was, for the most part, quite ridable all day – the worst road we had to ride was I-40, which we had to take for the last 10 or so miles into Needles. Five years ago, this was a section that Lon and I had missed because Lon wanted to scout out a possible dirt road that he thought might at one time have been 66. I think he concluded that it was just a dirt road that more or less followed the train tracks. We both enjoyed our floats before doing the last mile to the motel.